Christian Horner has hinted that Red Bull could have another unusual livery planned for the start of the racing season. The team is running in camouflage livery in Jerez, in part because it genuinely serves to make it harder for rivals to analyse the car. “The camouflage livery actually came out of a helmet that Sebastian ran last year.” said Horner. “It was quite fun. We thought it would be interesting to extend that concept to the entire car, and Dietrich [Mateschitz] liked it when he saw it. I think it epitomises Red Bull, really. Asked if fans will be disappointed when the camouflage livery is dropped he said: “They won’t be disappointed because the livery will be even stronger. It’s great to so something different, it’s been extremely well received. It’s difficult to get detailed shots because obviously it confuses your eye-line. It certainly seems to have had a great reaction. Dany Kvyat has been lapping Jerez with no front wing on the RB11 after he damaged the only example of it in contact with the barrier this morning. New parts are on their way but the team opted to continue to run a few laps for ongoing systems checks and so on. “Dany had a very slight off on an install lap this morning, on cold track,” said Christian Horner. “He was just changing something on the steering wheel between Turns Two and Three very lightly touched the tyre wall with the front wing. That’s damaged the front wing. “It’s the only front wing assembly that we have in Jerez at the moment, which is relatively usual for when you’re not abundant with spare parts. That’s why we’re running without the main plane at the moment. Obviously more components coming down later this afternoon and this evening and during the next few days. Sixty trophies were stolen from Red Bull Racing’s factory in Milton Keynes in the early hours of Saturday morning, the team has confirmed. A silver 4wd vehicle was driven through the front entrance and six men loaded the trophies into another dark coloured Mercedes before making their escape. Security staff who were on duty at the time were not hurt. “We are obviously devastated by this serious factory break in, which saw offenders drive a vehicle through our front entrance and steal more than 60 trophies which took years and hard work to accumulate,” said Christian Horner. “The break-in caused significant damage and was very upsetting for our night officers who were on duty at the time. The offenders took items that not only did not belong to them, but which represented the efforts of a group of dedicated, hard-working individuals. “Beyond the aggressive nature of this break-in, we are perplexed why anyone would take these trophies. The value to the team is of course extraordinarily high due to the sheer hard work and effort that went into winning each and every one. But their intrinsic value is low; they would be of little benefit to those outside of the team and, in addition to that, many of the trophies on display were replicas. A Thames Valley Police statement said: “Police were called at 1.30am today (6/12) to the Red Bull Racing factory where a group of around six men used a vehicle to drive through the front entrance to gain access to the premises. 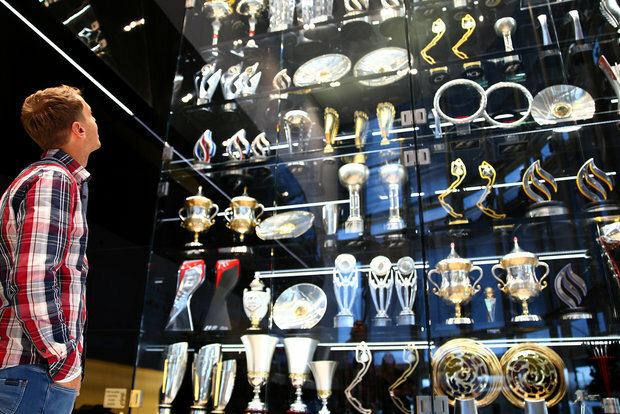 “Once inside, they stole over 60 trophies belonging to the Red Bull Racing team. Night staff who were on the premises at the time were not physically harmed. Red Bull motorsport boss Helmut Marko insists that the illegal front wing flaps on the RB10s in Abu Dhabi were the result of a “naïve” interpretation of the rules. Daniel Ricciardo and Sebastian Vettel qualified fifth and sixth but ultimately started from the pitlane after the FIA discovered a spring arrangement that allowed the flaps to flex. Meanwhile Marko said he was happy with the progress the team made in 2014 after its disastrous start in testing. “We did much better than we expected – we won three races, second in the constructors’ championship, in the drivers’ third and fifth. So the recovery was good. Strategically, everything was done right. We achieved the maximum, we learned a lot, and we had to fight and keep motivation up. But it paid off. Sebastian Vettel believes that he has not been frozen out of technical discussions at Red Bull since he announced that he was leaving – but he concedes that inevitably he’s not being updated on developments for 2015. “I think I’ve been long enough with the team to know what’s going on,” he said when asked if he was out of the loop. “So I don’t get pushed outside. After five years you know someone. There’s mutual trust. “All the stuff that happens on the car for next year doesn’t get discussed with me, which is normal. But equally there’s stuff that we test here on the track which I’m sure will possibly be used next year, and from a team point of view it’s the best foot forward to use both of the cars to do that. RBR boss Christian Horner has confirmed that Sebastian Vettel will take part in Q1 in Austin, but it will be only a token appearance to ensure that the German fulfils the 107% rule. Vettel is due to start from the pitlane thanks to taking a complete sixth power unit. “I think it’s a silly rule, isn’t it?,” Horner told Sky TV. “To have to eliminate a car totally from qualifying, it doesn’t really make sense. People are here to come and see the guys qualify and do the best they can. It’s a crazy situation that we’ve got a four-time World Champion effectively not taking part tomorrow. We will take part in the first part of qualifying, but we’re going to be limiting mileage to an absolute minimum. “The problem is that the rules dictate that wherever he qualifies, he’s in the pitlane. This power unit has now got to do three races. We know they’re fragile so we’ve got to save as many kilometres as we can. Theoretically he’s only go to do one or two laps. Vettel was last in FP2 as he missed track time and had no need to run in qualifying trim: “It’s been a busy day. We had a gearbox change between P1 and P2 with Sebastian, and then a rear wing change that took a long time during the session just because we’re trying different set-ups. We managed to get the data we wanted out of the session, now it’s a matter of crunching the numbers tonight and working out what’s the best thing to do for the race.